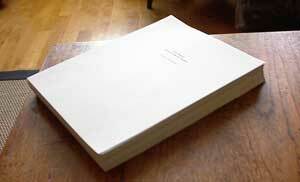 Is on it’s way to my publisher. This one is called “Yarn Harlot: The secret life of a knitter”, or at least that’s what I think it’s called. That’s what I named it. It remains to be seen what the publisher calls it. It will come out this fall. You will have to excuse me now, as I have a date to lie on the cool tile floor of my kitchen and alternately sleep and weep with joy for at least 17 hours. I will knit when I get up. In which the brilliant Laurie sums up, demonstrates her genius and makes all of us feel like throwing our knitting away. Everything will bleed into gold or yellow. Mixed colors often spin up into particularly nice yarn. The steamer water will be full of dye. 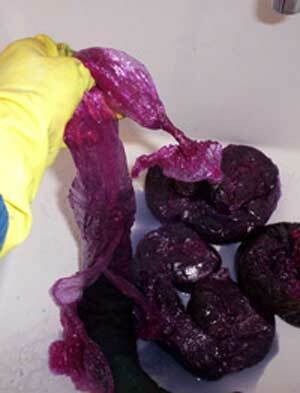 The wool sausages will look horrible, even if you use saran wrap that is NOT violet. 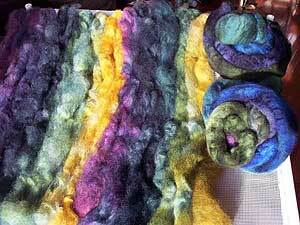 If you use carded wool instead of combed roving, you may end up with felted wool despite your best efforts. You will then need to soak and rinse the wool sausages (leave that roving in there!!) until the water runs clear. The water should be the same temperature that the sausages are. That temperature does not have to be EXACT, but close. I do the last rinse in the washing machine in order to spin all the moisture out afterwards. And make sure that your washing machine does not dump water on things during the spin cycle!! 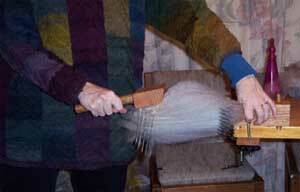 The reward comes afterwards when you can untie the end of the wool sausage and pull your roving out! When the rovings are wet, they can sometimes look disappointing. Especially commercial rovings, possibly because they are more compacted. When the rovings are dry, they look wonderful. More patience, alas!! What do you do with a painted roving? We have to let them dry thoroughly before spinning, etc. The Romney rovings, formerly gray, are on the left and the Bluefaced Leicester rovings are coiled up. Lovely, eh? 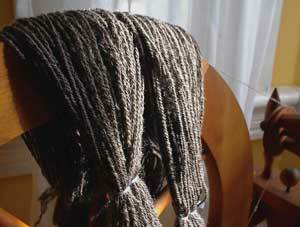 Now we are GLAD we sacrificed that lovely gray roving from the other day. When your rovings are PERFECTLY dry, you spin them up into very fine singles. 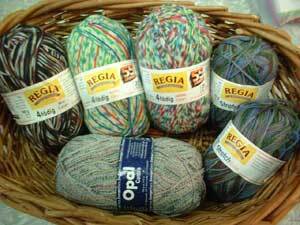 You can knit as singles, ply together with another solid color single, or Navajo-ply (The Joy of Handspinning has video clips). The first two options make the most of your singles. Knit the singles (after setting the twist on a plastic niddy noddy) and you have the full yardage, say 300 yards; ply with a solid color – again 300 yards. Since Navajo-plying is basically a three-ply, your 300 yards of singles becomes 100 yards of yarn. 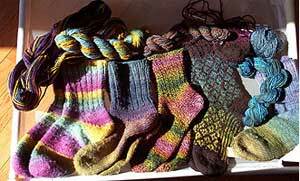 The two pairs of socks and yarns on the left use Navajo-plying technique. The far left socks, a.k.a. my Lifesaver socks, are dyed bluefaced Leicester. Note the bands — you can split the roving in halves and quarters so there will be more color repeats. 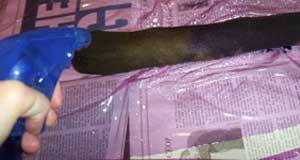 And the sock next to them come from Romney rovings (one set of colors changes up the leg). The middle sock, with the toucan colors, is knit from commercial roving I dyed, spun and plied with a black single – stretching my colors! 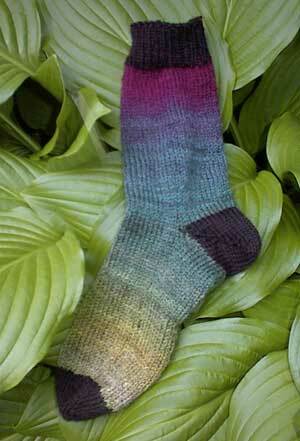 The next to the last sock also helps extend the use of your handpainted yarn. 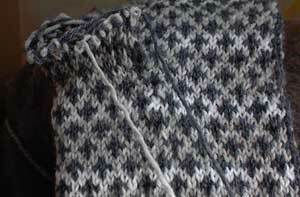 That sock and the one in progress above it (which you cannot really see) use a fairisle pattern with one strand of black wool and one strand of the multicolor yarn. 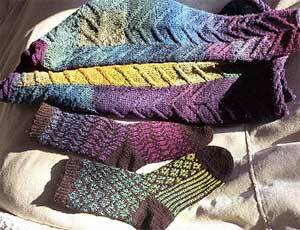 The far right sock is knit from singles, like the yarn above it. The sweater I made by picking a cable pattern that I particularly like and knitting panels in that pattern. Putting it together took a lot of careful seaming, but the cables actually helped me line things up. I enjoyed myself thoroughly arranging and rearranging them before deciding how they would finally fit together. 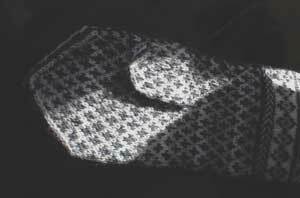 In thinking about socks, you can get more info than you could possible use from the Socknitter web site. They have LOTS of tutorials for all kinds of socks of different weights. 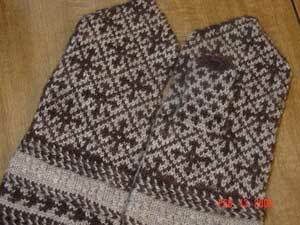 The ones I have knitted above are simple toe-up socks with a small fairisle design. You can, in fact, make up your own design or do a variation on ones that you have seen. Below you will see a new sock in progress with a honeycomb grid and my worksheet. Simple graph paper will do, but lots of sites give you ways to print out knitter’s graph paper – here is just one on the Brown Fox Fiber site : http://www.brownfox.com/knit-graph.htm. 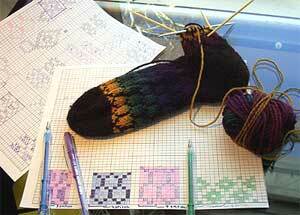 I have four patterns below marked on mine for the three fairisle socks on display. I chose more elongated honeycombs than my first effort. For my socks, the yarn came out to about light worsted/DK weight. 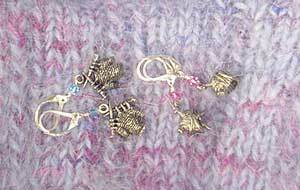 I used 48 stitches on American size 3 needles. That number of stitches is particularly nice because it divides evenly for so many different stitch repeats: 2, 3, 4, 6, 8. Remember my feet are VERY small so this number is fine for me because it blocks out to 5-6 stitches per inch. You could easily go up to size 4 or even 5 if you knit tightly. Please note that the sock in progress puckers; that effect blocks out. 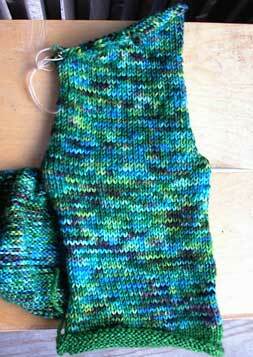 In fact the blocked sock is larger, so do not panic if it is tight on your foot. I am never 100% sure how the wool sausage dyeing will come out, but I do know that the two rovings will match since I use the same dye in the same order on both. And I also know that SOME form of spinning and plying will make the colors work well. 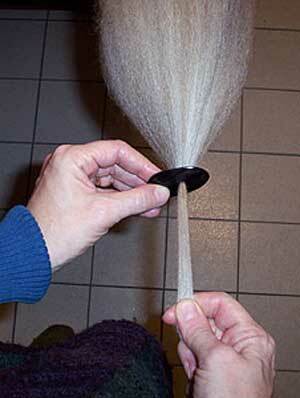 For those of you who are “pantyhose-challenged,” you can always buy a braided bath scubbie – you know those mesh jobs? 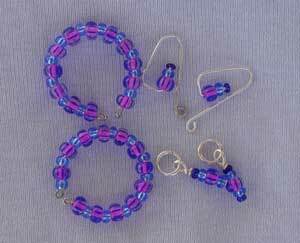 The long ones that look like braids are made up of several rolled up tubes of mesh. If the tub is too wide, you could just sew down the middle to make two pockets. That strategy would make matching your sock rovings that much easier! Silkworker – be aware that silk dyes differently than wool! Before you ask, there is no website, no yarn or socks for sale. I do this kind of project for fun on top of my day job. And now you know how you could do it as well!! Many thanks to Laurie for doing this, I know that it was an unbelievable amount of work. I have it on good authority (ok…Laurie told me) that some of the above roving is in the mail to Harlotville. When it arrives we can take a closer look at the spinning. Happy weekend, especially to Laurie. By now, Laurie needs no introduction. Today she dyes roving and I try to convince myself that making a really big mess with dye in my hopeless persuit of “laurieness” is counterproductive, since Laurie’s blogs are supposed to help me solve problems, not create them. I am well aware that dyeing roving only leads to spinning roving, and once that is done I will be helpless in the face of the urge to knit it instantly. This will not help me meet my deadline. Must resist Laurie. Once I have my roving all neatly stuffed in, I tie a knot in the ends of each casing (note that I have stopped calling it pantyhose; it has been transformed). Then comes the hardest part: soaking. You need to soak your encased roving for at least a couple of hours in water with some Synthrapol or dishwashing liquid for better wetting. Patience is a virtue. 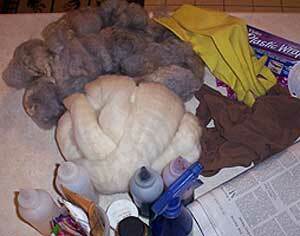 The dyeing here will be of the creamy roving because you will be able to see the colors more easily. 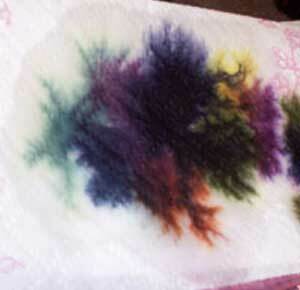 I often use some paper towel to test out different color combinations. 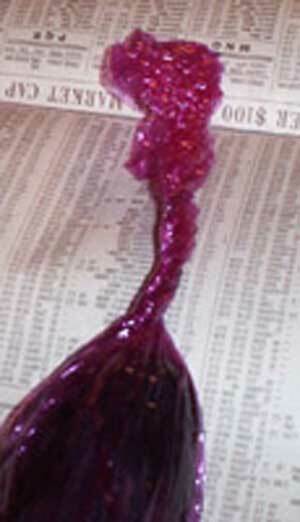 Then coil the wrapped case and place it in your dye pot on a steamer rack of some sort. 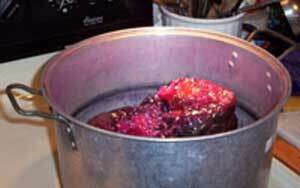 Neither the dye pot nor the steamer should EVER be used for cooking. Never. Ever. In the coil below, you will note that the lighter color is coiled on top. 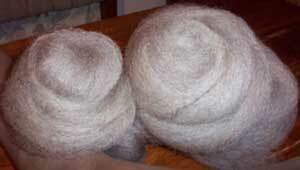 This wool sausage is the gray roving which I dyed in golden ochre on one end. That end needs to be on top! In general, lighter color rovings should be on top and darker colors should be on the bottom. Tomorrow – General Principles, Steaming, Patience and The Reveal! Note from Steph: Even if all of this is not your cup of tea, I urge you to pop in tomorrow and see the things that Laurie makes from this roving. Incredible. When I grow up, I want to be Laurie. If this is Wednesday, I must be.. I miss you very much. 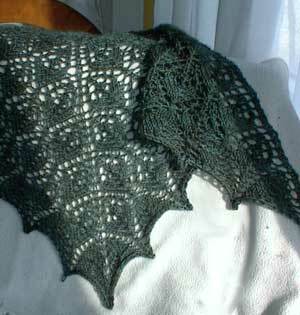 I am very lonely here in front of the computer with my browser closed and my “you’ve got mail” sound turned off so that I cannot be pulled into the world of other knitters. This is probably best since I’m existing on a really stupid amount of coffee (like…I can feel my hair growing) and chocolate (thanks Emma!) and slowly coming to believe that I’m going to meet the March 1st deadline with room to spare (should be at least 20 minutes of leeway, though I may only think that because of the sleep deprivation.) I did take a break yesterday to work a little on the yarn for Joe’s Gansey. Total time spent…about 40 hours, for slightly more than 500 metres of yarn. Since I have calculated (though mathematics has always been a trial for me….) that a gansey for Joe will take at least (AT LEAST) 1800 metres – Well. Lets not discuss it any further. Suffice it to say that if there is anyone who doubts my love for the man, this aughta shut their yap. Welcome back y’all. (Or is that “y’alls” I can never figure that out. I was in a “Waffle House” in Tennessee once and the lady who poured my coffee said “Y’all want cream in that?” which confused me, since I was alone. Clearly, “Y’all” must be the singular, which perplexingly must mean that “y’alls” is the plural…right? Maybe this is something else Laurie can tell us, since she’s an English professor.) Laurie is back today with the one I’ve been waiting for, since I suffer a pathologic inability to Diz. I’d also like to draw your attention to the sweater Laurie is wearing in the photos since it’s made of the yarn that this tutorial teaches you how to make. My husband went to some trouble to record this whole process so I offer here some pictures of my combing and the process of removing the fiber from the combs with a diz. So this entry is short on text, but picture-rich. Lash fiber onto comb. Turn comb sideways and lock in place (I use a Canadian comb set from Ray’s Woolcombs that locks into place nicely but so do a lot of others). 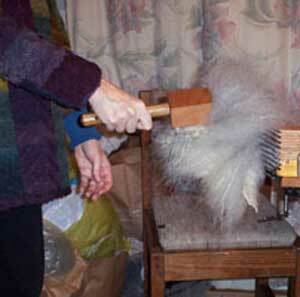 Start combing by swinging your moving comb into the tips of the lashed on fiber. I find that about a third of the way in works well. Note that I lash the fibers back on the stationary comb and then sometimes reach around to hold them stable behind that comb. 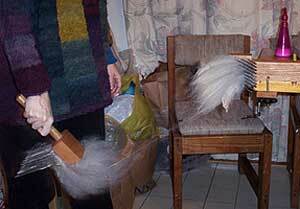 This strategy lets the OTHER comb do the straightening of fibers. 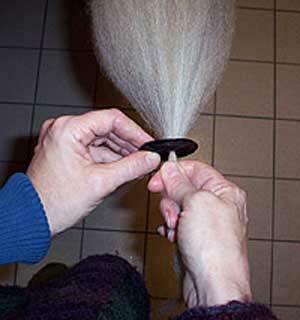 You then coil the long roving into a nest and get ready for stuffing the pantyhose. 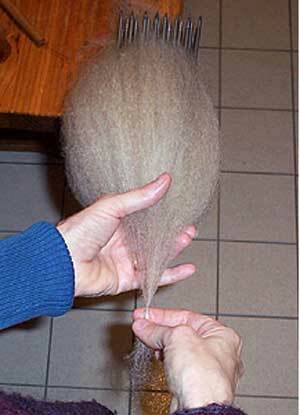 I usually let the combed rovings rest for a little while before stuffing them into the amputated pantyhose legs, so we will take a break here to contemplate the joys of combed fiber. 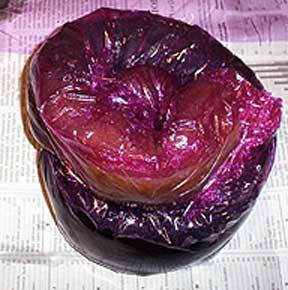 We can also consider whether the rovings are just too yummy to dye at all! Steph here again…just a note, I have to tell you that Laurie and I have been friends for some time now and we talk on the phone, and see each other once a year and because she lives far from me I have never been in her home. This means that I have to tell you that I am absolutely shocked at how tidy it is in these pictures. I had expected more of a kindred approach to housework. Welcome to the first of Laurie (yes, that Laurie’s) guest blogs. Laurie is a talented, inspiring and sadly blogless soul, who has graciously spent several days getting together an awesome dyeing tutorial. Laurie has done so during this particular week knowing that I am a little busy right now. (Read: way, way over my head on the work stuff due March 1st. So far in over my head that I stayed at my mothers last night so that the kids and Mr. Washie couldn’t bug me.) Laurie’s decision to do this is a gift to both you, who will learn any number of very nifty new things, and to me…who may surface with my sanity (Stop that. I am too sane…) intact as a result. Feel free to ask Laurie questions in the comments, where she will be lurking about. Enjoy today’s installment, in which Laurie lets you know why throwing away those pantyhose last week is a decision you will live to regret. Modest Disclaimer: I want to point out right here and now that I am not claiming any originality here. 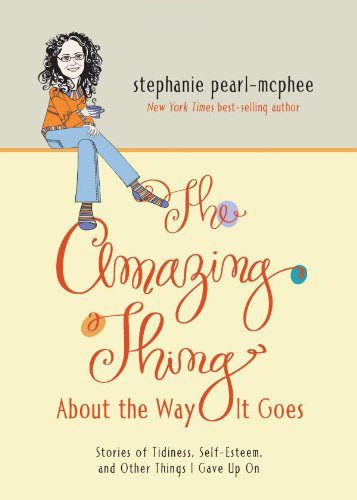 Deb Menz’s book on color, Hands On Dyeing, assorted websites and lists, Spin-Off and a fellow member of the Maine Spinner’s Registry are all sources for this information. In fact the member of the Maine Spinner’s Registry (whose name has, alas, fled my aging brain) freely shared the idea for the casings which I use. All I promise here is what I do to dye my rovings and a little of what I do with the roving after I have dyed it! Clockwise from the lower right hand corner: newspaper for spills, spray bottle full of vinegar (acid dyes), your dyes (koolaid, cushings, Jacard Dyes, Country Classics, easter egg pellets, whatever), squeeze bottles of some sort to apply the dye, roving (white for clear colors, gray for jewel tones), rubber gloves, plastic wrap (yours need not be violet, mine is because of a spousal quirk), mask to protect you from breathing dye particles, and, most crucial of all, your casings for the rovings, i.e. pantyhose. I am particularly fond of Cushings because some of their colors “break” interesting ways, that is, they spread into their constituent colors. The following are favs: Myrtle Green, Red Grape, Peacock (doesn’t break, but a great blue with just a hint of green), Olive Green, Purple, Rust (for folks who like oranges and browns). Among the Jaquard dyes, I really like Gold Ochre, which is a dark yellow that goes well with the colors above. Country Classics makes a great purple-fuschia called Raspberry and a true Teal. The strainer and the funnel are useful for getting various fluids, water and dye respectively, to go where you want them to go. (Actually the funnel verges on essential for getting your dyes from the jars where you mix them into the squeeze bottles you will need to apply them. 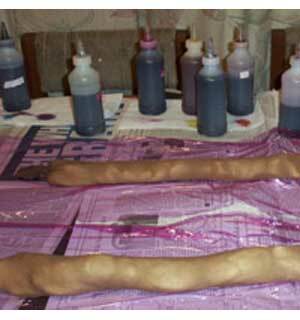 You can pour the dye mixture, but that process can get VERY messy.) Synthrapol helps the dye to penetrate your fibers, but you can use a teaspoon or so of dishwashing liquid to much the same effect. 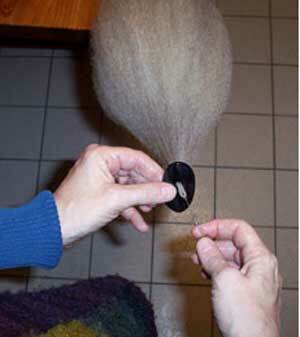 You can also guesstimate the roving amounts rather than using a scale. I use the scale because I know that I need about 2 ounces of roving per pantyhose leg in order to have enough wool for socks. 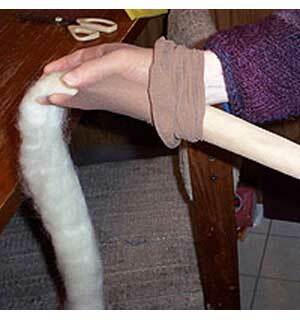 You can get pretty close by balancing your amount of roving against a 50g skein of wool – just close your eyes and hold one in each hand. Switch if you are unsure. 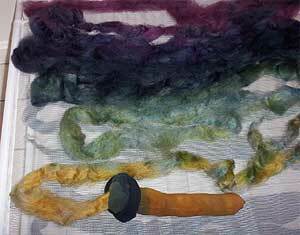 I use either prepared roving, the creamy bluefaced Leicester in the picture above, or my own combed wool, usually some form of Romney cross. Generally I prefer my own combed wool, especially when I can get gray wool. 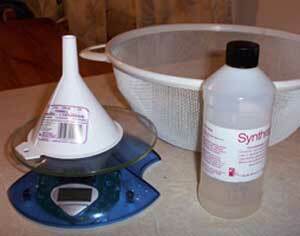 If the dye does not completely take, gray shows through less garishly than does cream or white. Also Romney wool is generally quite lustrous, and I prefer the way the colors look with the shine. Romney is a pretty strong wool and so wears well for socks. I know that this thumb looks like an ordinary thumb. I know that just *looking* at the seemingly simple thumb of the MSF mitten wouldn’t be any sort of tip off about what the thumb is. I know that there is no way for you to know what the thumb really is…why it is here. Why the thumb has come to exist in my life. Before I slammed my finger in the door (almost all better now) I had knit the thumb on the left mitten twice, and it looked like this. I didn’t tell you about the first time I had ripped the thumb back because, well…frankly I didn’t want to admit that even though I have a world of experience knitting Latvian Mitten thumbs (and this particular thumb in specific terms) that I had somehow made it look like a stinking pile of fetid crap. I quietly yanked it back, picked up the stitches again and carried on, keeping my pain and humiliation quiet. (There’s no reason for the blog to know everything). Then I suffered the humbling and self inflicted finger injury and put the mitten aside. Last night, when I noticed that I could think thoughts that didn’t involve my finger, I decided that it was likely well enough to resume mitten knitting and picked it back up again. That’s when, in a moment of sparkling clarity, I noticed that the thumb seemed a little…large. I compared the two mittens (Note to self: when knitting items intended to match, learning to do a little more comparison of the two items intended to resemble each other can be helpful) and discovered that the thumb of the completed right mitten had 32 stitches and the heinous, loathsome thumb of the left mitten had 39. Fine. I ripped it back. (I admit that I may have had some hurtful thoughts about the mitten. I’m sorry for that). I picked the stitches up again, this time deciding to do a little COUNTING, and carried on, really feeling pretty good about it. Charming little mitten. 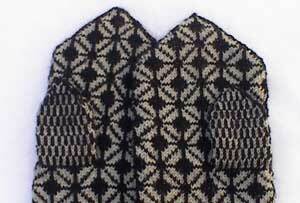 I knit happily onward, merrily knitting the sweet little crosses into the pattern until I took a break and compared the mittens. See it? While the two mitten thumbs are now the same size, I have forgotten the white stripe in the thumb. Blew right by it. I have to pull it back again. AGAIN. (You may ignore that I have already yanked the needles out in a momentary flash of temper) It is not enough that this is the third mitten. 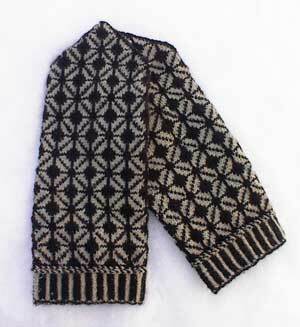 It is not enough that this is the third thumb on the third mitten. It is even, apparently, not enough that this struggle is public and humiliating. 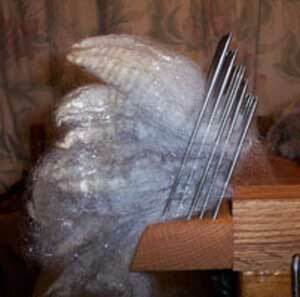 No, no….I have to knit it AGAIN. It’s ok though. I’m not even angry this time. No frustration, no upset, no cursing or hard liquor. Nope. Only peaceful, relaxed thoughts. It’s because I finally understand. I get it. It’s suddenly all so clear, here I thought that I was trying to knit a pair of mittens. I was wrong. The mitten is here to teach me patience. The mitten thumb and I are going to be together forever. 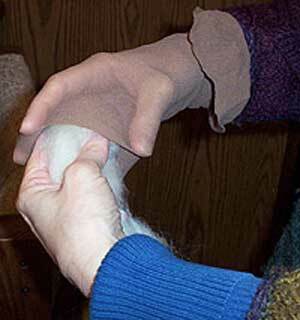 Each evening for the rest of my life I am going to sit down and knit this mitten thumb. Sometimes big, sometimes small, sometimes with the decreases in the wrong spots or over an odd number of stitches, each simple little thumb more craptastic than the last. Sometimes I will knit other things, even sucessfully…but it is always going to come back to me and the mitten thumb, every night….forever. It’s my destiny. Today Sam is 11. This means that I can report with great accuracy the matters of Sam being 10. She learned to snowboard, and got her very own. She learned to snowboard with Ken because even the thought of the littlest of my daughters hurtling down the side of a hill strapped to a board is more than I can look at. My daughter is braver than me. We were visiting our small friend Max one day and I realized that neither Max’s Mum nor I was watching over him. Sam was old enough to keep a toddler safe. This struck me as incredible, since she was a toddler last week. I’m sure of it. Sam learned what “mean” meant, and how many other 10 year olds you could apply it to. She found out that I am a dork. Luckily, Joe is still somewhat cool. Her feet grew a size bigger than mine. I cried more than once that nobody in this whole house is small enough to fit on my lap. While this is not Sam’s fault, I do hold her somewhat responsible. 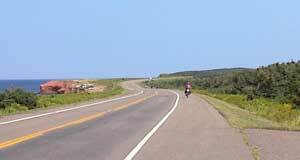 She cycled hundreds of kilometres in the summer without realizing that was pretty cool, pretty far, or pretty unusual. 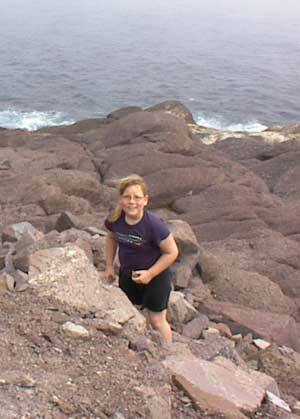 She swam in the Atlantic ocean, hiked Signal Hill, saw Green Gables, stood on the most Easterly point of North America and shopped for yarn across the Maritimes. 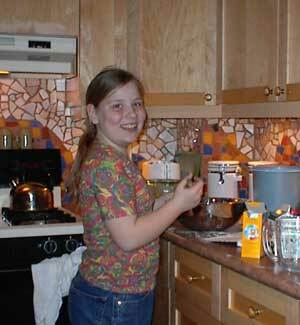 She baked a decent batch of cookies without help. She drove me insane asking repeatedly about getting the top of her ear pierced. 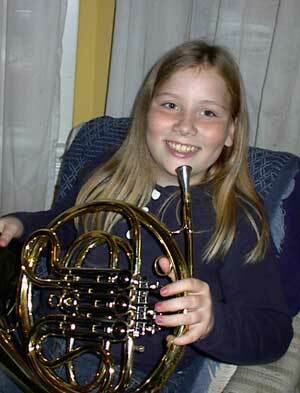 Sam learned to play the french horn without it sounding like an elephant in labour. (I personally would like a couple of points for this one. A lesser mother would have bought a bus ticket). She worked on her french and displayed a surprising (and largely useless) propensity for french involving pizza toppings. She only slept in our bed once. Knowing that it was likely the last time she would ever do so kept me up looking at her. She went to sleepaway camp and when the bus left, I was the one who cried. She was smart, funny and the best reward for not having killed the first two. Happy Birthday Sam. Hope being 11 is a gas. (and no…you can’t have the top of your ear pierced). I’m delighted to reveal that Michael has won the coral fleece. I was actually thinking about rigging this one, mostly because he is an enormous whiner who won’t let up. I thought better of it though, and pulled names from a hat. I’d like to thank the fates for the moment when I withdrew his name, thus freeing me both from the guilt of a fixed selection, and his incessant whinging for a gift. The finger continues to be troublesome (although it’s much, much better, thanks for asking) so I continued on straight needle knitting last night. This little sweater from Sweater Kits continues apace. The label says “Kids Handpainted Cardigan”, but I don’t see it on her website. I wrote a little note, but haven’t heard back yet. I’ll let you know. 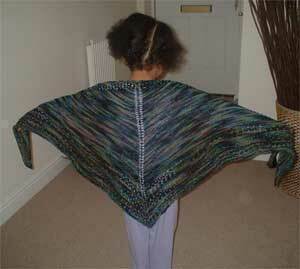 The variegation is still not ticking me off, so I’m sure the yarn is discontinued. (Yarn Rule #12). I have survived. I spent yesterday very quietly, trying to spread goodwill and peace while not attracting any sort of planetary attention. I suspect that all of this is the fault of dissing February. You can’t expect to come out hard hating on a whole month and expect that it won’t exact a little balance. I beg Februarys forgiveness, display my wounded finger as penance and respectfully point out to the planet that if the sun shone maybe just one freaking day in this forsaken wasteland of a month that maybe people (read: me) wouldn’t be so biased. But I digress. Round about now I was starting to feel a little bit sorry for myself, though I kept it quiet. There’s only so much sympathy you can expect for injuring yourself in a moment of less emotional grace than we would really hope for in a grown woman. 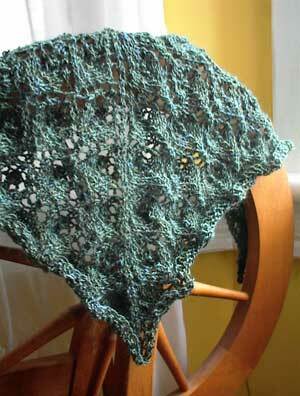 I gave the flower basket shawl a go. I have good news and then bad news and then good news again, so don’t let the sad part in the middle get to you, because things pick up again right after. It turns out that I can knit single colour straight needle stuff. 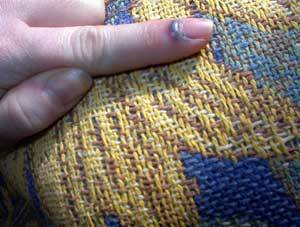 (Who knew you could knit for 30 years without discovering that your left hand pointer finger does SQUAT? The same cannot be said of DPN’s or circulars where I apparently use that finger in a critical way.) I discover this while I was knitting The Flower basket shawl. That’s the first good news, since I don’t know what I was going to take up if I couldn’t knit for two days in a row. Maybe smack. The bad news is that I knit on the shawl for a while then made the decision to rip back and go up a needle size and ripped out the whole thing. All of it. Every single stitch. This, oddly…was a really good feeling. I got to thinking that there really aren’t many times in your life when you can completely undo a mistake. Times when there are no consequences, no record, no history, no talk. Nothing. You make a mistake and you can completely erase it and try again. Very comforting really, and not at all like losing your temper and slamming your finger in a door, where the error of your ways just sits there throbbing at you. I went up to a 5.5mm needle (noted here so that when I make the next one there is a snowflakes chance in H-E double hockey sticks that I will be able to get it right.) The good news is that I finished the thing anyway. The flower basket shawl is seen here looking like mountainous crap awaiting a decent blocking, which I am certain will be completely transformative. I believe, though it may really be too soon to tell that I am obsessed with this pattern. Obsessed. The idea that I can knit a seriously funky scarf (with is really closer to the truth than “shawl”) out of less than 200m of yarn should be extremely exciting to all the spinners out there. Admit it, how many unique 200m skeins do you have? Plus, I love blocking. A lot. I think it’s the pins. Tune in here Monday when the spectacular, very clever and heartbreakingly blogless Laurie (yes, that Laurie) will walk us through how, exactly, she dyes the roving to make the yarn to make these. From fleece to yarn, Laurie’s secret dying system revealed. Episode one, in which Laurie tells you about the things you will need and the way you get started begins here on Monday, with rising drama in the dye pot (and rumours of squirt bottles) on Wednesday, and the stunning conclusion on Friday. Don’t miss it. Yesterday bit. That’s all. It was one of those days where (if you are an optimist, and I am) then you just keep investing. Keep looking for that moment when it’s all going to turn around. You know? I walked Sam to school (in the rain) and Sam did that new Thing that she is doing. Have I told you about the Thing? She walks five paces behind me. Exactly. Not more, not less. She doesn’t fall anymore behind than that, because we are walking at exactly the same speed. It drives me insane. I stop every few minutes to let her catch up (because she is a child, not a puppy and it feels wrong to be out front of her like that) and then I take five steps and she does not. So I stop. So she catches up. So she stops. We go all the way to the school like that, starting and stopping and starting with me becoming more and more angry about The Thing. (In the rain. I hate rain). After dropping Sam off I realized that I was feeling a little hostile, so I decided to walk through the park, turn it around you know? Get a little exercise, try to improve the day. You know. I was halfway though the park when a dog the size of a Hummer ran after me, jumped on me, knocked on my arse (in a puddle) and bit my Latvian Mitten. Cujo was called off by her owner, who asked if I was ok and then told me that this 300kg biting machine was “excitable” and “liked me”. I *did* resist the urge to ask what the slathering beast does if she dislikes you. I *did not* resist the urge to suggest that the demon sent hell-hound should be on a leash. This was when the owner told me that “I don’t need to get all bitchy about it”. I decided on the way home that I don’t like her. Then I picked up Sam from school (in the rain) and she gave me a hard time all the way home because someone spoke rudely to her at school. Me? I’m an optimist, so I kept my head above water until I dropped a container of extremely old red pepper dip on the kitchen floor (where it exploded) and then knocked over a cup of coffee while cleaning it up. Still, I thought things might be Ok until Sam, trying to help me with something raised her arm quickly, exactly as I was turning around – thus punching me squarely in the face. At this point, I may have lost my temper. (Fine. I did lose my temper.) I stomped off (red pepper dip on my socks, coffee on my pants…with Mr. Washie making that sick squeaking in the background) and went upstairs and decided (sort of on impulse) that I would feel a whole lot better if I slammed some stuff around. That was when I slammed my finger in the door. Then I got a *&^%$# beer. back here. Do not click on them you are squeamish. Colours are mostly accurate though the vivid nature of it just isn’t there). I imagine that Lorette will expect me to recover fully. Understandably, given the seriousness of the finger injury (I cannot believe I typed that) There was no knitting last night. 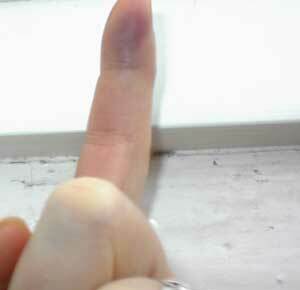 Today, the finger is still spectacular and rather a surprising size, but feels better. It still has a throbbing pulse, but I can now form complete thoughts that do not consist only of obscene swear words strung together with stunning alacrity and talent. I will attempt to spin today. Do not hold your breath for stunning results. In order to restore some balance to the universe, Today we will do more TSF presents. Little sweaters, to Rachel W. and little balls of yarn to Andrea G.
They will be travelling to Adrienne M.
Chris has a really cool one to offer, though it’s a bit of a mystery to me. Chris is offering 10-20 hours of time to “Secure a website”. Chris explains that this includes stuff like ” looking at a site from a code/access/vulnerability standpoint, produce a nice report and then help fix any issues. (out of date code, non validated fiends, SSL incorrectly installed etc. The idea is, especially if you take credit cards or have a machine that stores personal data…this can be done to secure it.” Chris explains, but basically it helps keep bad things from happening. Very, very bad things. (Am I the only one who thinks that “non validated fiends” sounds especially bad?) Since I don’t know which of our lovely TSFers has an online shop or need for this, why don’t we do it this way. The first person to email me wanting it…gets it. 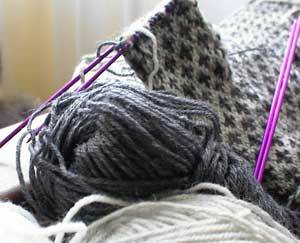 Julie has 4 hanks of the new Knit Picks “Alpaca Cloud” in Iris that she is willing to part with. (She’s a better woman than I am). She’ll be mailing it to Beate W.
so I hope that Christie H. knits socks! knit from Koigu with a beaded edge. It will be round the shoulders of Toni F.
Rabbitch went into the stash and came up with this. 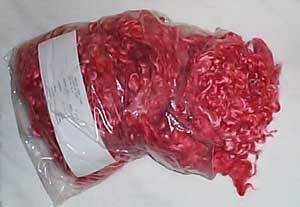 It’s 18 oz (about 500g) of a Lincoln fleece in coral. Since I don’t know who spins, I’ll draw from among the KWB keeners who email me wanting it. I promise not to pick myself. Denise has a copy of Mindful Knitting, written by Tara Jon Manning which she is graciously passing on Sue A. one of the clearly mindful knitters in TSF. Finally, last but certainly not least. Sandy’s mittens. (Picture stolen from Sandy’s site without permission but not hotlinked, which should be worth something.) Sandy was the first person to come on board with Knitters without borders, and that makes her, and these mittens very, very special indeed. Pamela R., You take good care of them…ya hear? Tomorrow, an important public service message about a guest blog. Get ready.